Bats! 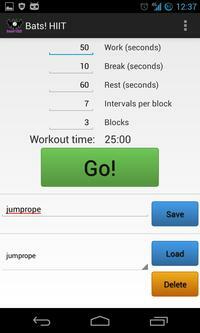 is a simple but powerful High Intensity Interval Training (HIIT) timer. A HIIT workout with Bats! HIIT comprises a sequence of alternating rest (warm up/cool down) intervals and work blocks. A work block is a series of work/break interval pairs; each work interval has a corresponding break interval. For example, you might configure Bats! HIIT to include 4 work intervals per block, with a 50 second work interval and 10 second break. Such a block would take 4 minutes. Bats! HIIT always inserts rest intervals between blocks, and always includes a warm up and cool down interval. Bats! HIIT always gives a warning consisting of 4 short chirps when you're about to transition to a new interval. Every work interval begins with a single high-pitched beep; break intervals begin with a descending, two-tone beep. Rest intervals do not have an initial beep. During work intervals, your phone's screen will be green. In breaks, the screen will turn yellow. Rest is indicated by a red background. 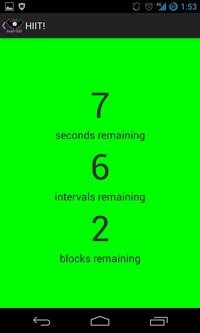 Your phone will also tell you how long is left in the present sub-interval and how many work/break pairs and blocks remain. You can save/recall/delete stored workouts. "Last workout" is automatically created whenever you do a workout, and is restored when the app is next started. When you're exercising, you want to be able to see your progress without unlocking your screen. Bats! HIIT prevents your screen from turning off, though it does allow it to dim for power savings. 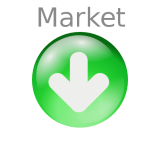 This lets you know at a glance how you're doing. This is the reason that Bats! HIIT asks for Power Management permissions. Bats! HIIT is free, open-source software. You can download the code from my Github repository and build it for yourself if you'd like.